Townes Van Zandt is an undisputed songwriting legend, however his studio recordings are a bit of a mess. Producers, record companies, and maybe the artist himself, didn't know what they wanted out the records, adding odd styles/instrumentation and going for a "hit". The truth is Van Zandt is at his best with his voice, humor and an acoustic guitar in a small bar, see Live At The Old Quarter House for RtBE's choice as the definitive Van Zandt release. In early '73..Van Zandt paid a visit to his friend Bill Hedgepeth in Atlanta, Georgia. Hedgepeth was a journalist with whom Van Zandt felt a strong connection. As the itinerant musician would do many times in the years to come, he availed himself of Hedgepeth's surprisingly high-tech home studio (the writer was a musician, too) to lay down rough recordings of whatever songs were bouncing around his brainpan at the time. During this particular visit, those songs included a couple of brand-new tunes he would never release, a few covers that would likewise never see daylight, demos of songs he'd record that year and a couple of songs from his previous album. Recorded in the simplest of circumstances with only Van Zandt's plaintive croon and acoustic guitar. These demo quality tracks are an excellent capturing of the moment, but are elevated even higher because of the intimacy and the strong playing from the mercurial artist. Van Zandt is the rare talent who can make deep classic murder ballads, on this release "The Hills of Roane County" sound just as affecting as tossed off light love covers, here it is "Forever, For Always, For Certain" originally written by Richard Dobson. The two new/unearthed originals from Van Zandt are the opening "All I Need" and the title track, both showcase Townes range. "All I Need" is deeply searching/wandering as the restless soul strums and plucks with forward/retreating pace, spinning his wheels while stunning with different lyrical twists. "Sky Blue" is just picture pretty, straight ahead folk floating along. Classic "Pancho and Lefty" is excellently presented with a calm demeanor and perfect sound while the chilling "Snake Song" and "Silver Ships of Andilar" are distant with echoes which only enhance their hypnotic, eerie effect. The minimalist recording style and unprofessional production do not diminish things much at all if you understand the story and situation going in. Old favorite "Rex Blues" has a pleasant run through and the album closer is a easy flowing rendition of Tom Paxton's "Last Thing on My Mind" with what sounds like some banjo accompaniment from perhaps Mr. Hedgepeth himself. 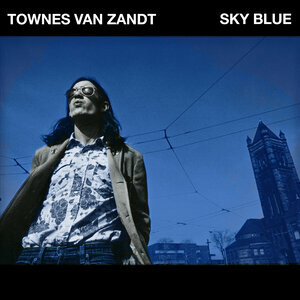 The beauty of a record like Sky Blue is that it is a great place for new fans to start and it is a must for any long time fan of Townes to own. For a true American troubadour the more releases the better and the intimacy of the singing and the songs trumps any minor quibbles with the recording quality.